Nowadays, there are thousands of wines available. Given that every wine has its own label and that it has some influence in our purchasing choice, it is not difficult to be a bit confused when buying a wine. Nonetheless, a proper reading of the label might help obtaining important and necessary information for an adequate choice. what to pay attention to in a label? Region – Besides telling us where the grapes come from, the region can also give us some information about the wine’s denomination – wines produced under geographical indication rules, Regional wines, etc. Year of Harvest – It expresses the year the grapes were harvested. It does not express the date when it was bottled or available on the market. This is an information that depends on the type of wine, its denomination of origin or with the producer’s goal. For example, in a 2011 Vintage Port, the grapes are harvested in 2011 but it can be bottled in 2013 and put on the market in 2015. 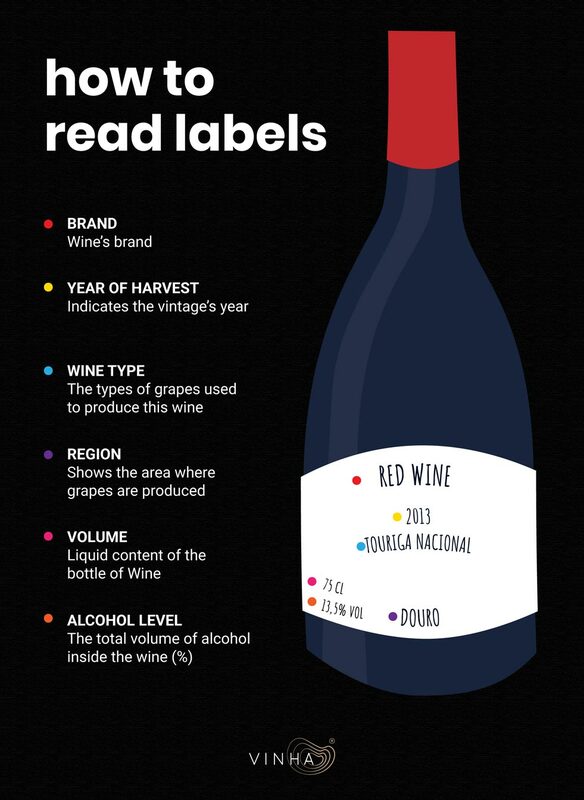 Grape varieties – In general, it is common to find the grapes a wine was made from by reading the label, excluding when it is made from grapes from the well-known Portuguese “old vines”. Alcohol content – Every label has this information and, generally, white wines are the ones with less alcohol content. The alcohol content depends on the wine style, region, grape varieties, grapes’ maturation and on the vinification process. Style and Vinification – In addition to know the type and style of wine, we can understand if it is a Blanc de Blancs (made from white grapes only), a Blanc de Noirs (made from red grapes only), or if it is a blend of red and white grapes, for example. A wine label has also a function of communication and marketing but its reading can actually clarify some doubts we have and make the wine tasting more interesting.